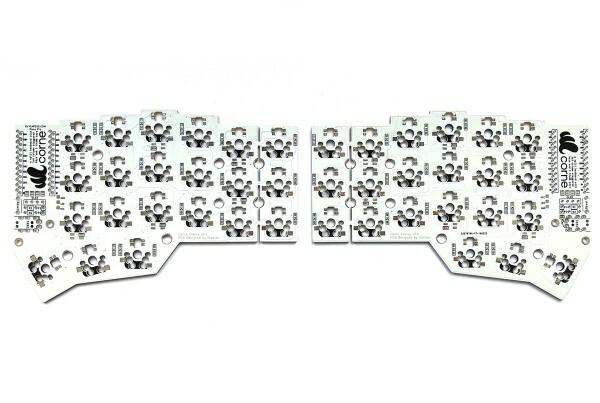 Product information "Corne Split Keyboard (crkbd, helidox) PCB"
This PCB version works only with Kailh Choc Hot Swap sockets (PG1350) & Kailh low profile switches. You also need the parts kit, 42x Kailh low profile switches, 2x Pro Micro, TRRS(4 pole) cable, Choc Keycaps, OLED SSD1306 (optional), 54x SK6812MINI RGB LED's (optional). This PCB version works only with Kailh MX Hot Swap sockets (PG1511) & Cherry MX and clone switches. You also need the parts kit, 42x MX switches, 2x Pro Micro, TRRS(4 pole) cable, MX Keycaps, OLED SSD1306 (optional), 54x SK6812MINI RGB LED's (optional). Customer evaluation for "Corne Split Keyboard (crkbd, helidox) PCB"